If you have ever wanted to cross-reference two actors or crew members to find out what they have worked on together, IMDb’s common search has you covered with an easy way to do just that. 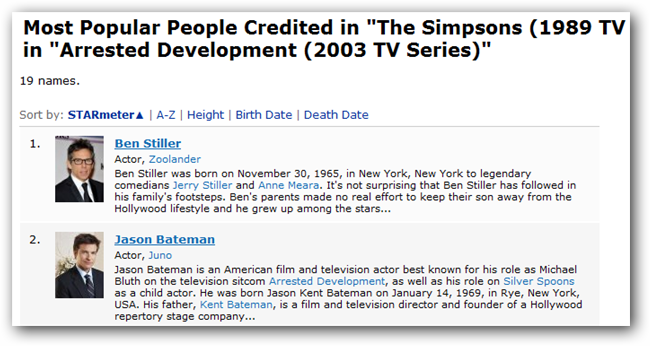 Whether you are trying to cheat at six degrees of Kevin Bacon or just trying to remember an actors name who was in Cloudy with a Chance of Meatballs and Hot Rod, IMDb common search can help. It will allow you to search for two movies or TV shows and find all of the common people who worked on them, or you can search for two actors and find all of the movies and TV shows they were in together. 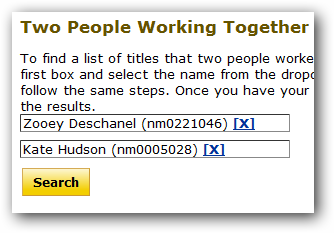 To search for movies that two people have worked on, type in their names and use the drop down to select your exact match. 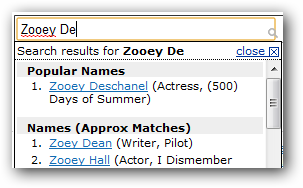 Fill in both search fields with the actors you are looking for and hit search. By default the search results will be sorted by IMDb’s MOVIEmeter but you can easily change the sorting from the options on the top bar. 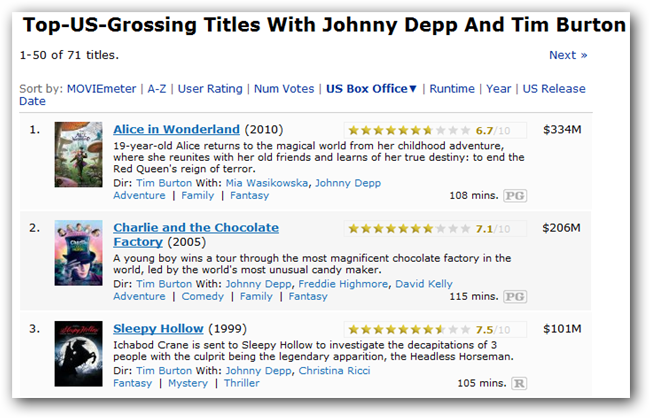 The sorting options makes finding things like the highest grossing movie with Tim Burton and Johnny Depp trivial. One downside is there is no way to filter the results to only show movies or TV shows which ends up showing a lot of talk shows that both actors have appeared on. You can use the common cast/crew search to seach for two movies or TV shows and find all of the people that worked on both. For example, search for all of the people that have worked on The Simpsons and Arrested Development and you will find people who have guest starred in both. The results page will show common actors and crew members so you can click on their names to be brought to their IMDb pages to find the specific movies and episodes they starred in.